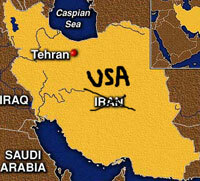 So it looks like the good ole U S of A is going to conquer Iran. ...Or are they? UFO expert Der Voron has a few suggestions for the would-be conquerors when it comes to naming conventions. Dear readers, dear officials. In connection with the coming conquest of Iran, (and the film about Alexander the Great and his conquests,) may I propose official renaming of some Iranian, Afghan, and Pakistani provinces to their Ancient Greek equivalents. Iran herself was called Ariana by the Ancient Greeks . Der Voron is a writer and translator. He lives in Minneapolis, Minnesota, and works as an independent contractor, you know, with computers.. Learn more about Der's famous Starcraft (UFO) book here. He can be reached through his web site.